Note: In 2019, Uzbek Journeys will not offer Ferghana tours. Unfortunately the roads in the valley are in very poor condition. The itineraries below are for information purposes only. Day 1: Begin with an early departure from Tashkent, around 8:00 a.m. to drive to the Ferghana valley via the Kamchik pass, (2267 metres). The drive is beautiful. After 4 hours drive, stop in Kokand, centre of the Khanate of Kokand that was toppled by the Russians. Visit the incredible Khudayarkhan Palace, Juma mosque, Dahmai Jahon and the Royal cemetery. There is an excellent halva maker in the mosque grounds! Lunch in Kokand. Visit the wood carving centre at the house of Master Haidarov in Kokand. It is a in beautiful setting and there is a small, family museum showcasing the seven generations of this family's work. The great-grandfather made special pieces for Lenin. Then drive to Yodgarlik Silk Factory. (Open only Monday - Friday; closes at 4:00 p.m.). Margilan weavers are the most skillful ikat weavers in the world. Here you will see the entire process from cocoon to finished ikat. Overnight in hotel in Ferghana. Day 2: Ferghana-Kumtepa bazaar, Margilan and Rishtan. Start the day at the Kumtepa bazaar, one of the best places to buy ikat silks. (only on Sundays and Thursdays). Visit the training centre of Rasuljon Mirzaahmedov, at the Sayyid Ahmad Huja Ishan Madrassah, Margilan. 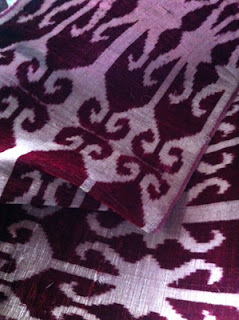 This is the renowned ikat weaver mentioned in my post on Oscar de la Renta's love affair with ikat. The setting of the centre, with its own canal, is lovely. There is also a master woodblock printer, Abdullaev Solidjon, at the centre. Visit workshops of master potters Alisher Nazirov and Rustam Ustmanov (and also the Japanese school there) in Rishtan. Their works are made from unique red Rishtan clay, and are painted with the ishkor glaze giving the pottery a distinctive blue-green colour.Overnight in hotel in Ferghana. Drive back to Tashkent via Margilan. Time to return to any of the other artisans visited on Day 2 in Margilan. Evening arrival in Tashkent. Begin with an early departure from Tashkent, around 8:00 a.m. to drive to the Ferghana valley via the Kamchik pass, (2267 metres). The drive is beautiful. After 4 hours drive, stop in Kokand, centre of the Khanate of Kokand that was toppled by the Russians. Visit the incredible Khudayarkhan Palace, Juma mosque, Dahmai Jahon and the Royal cemetery. There is an excellent halva maker in the mosque grounds! Lunch in Kokand. Drive to Rishtan and visit two renowned ceramic masters’workshops (and also the Japanese school there). Their works are made from unique red Rishtan clay, and are painted with the ishkor glaze giving the pottery a distinctive blue-green colour.Overnight in hotel in Ferghana. After breakfast visit Kumtepa bazaar near Margilan. (The bazaar is open on Thursdays and Sundays). Drive to Chust, famous for its skull caps, where you will visit a master skull cap maker’s home. Lunch at a six-storied chaikhana, a favourite plov spot for locals. On the way back stop at the right bank of Syrdarya river (formerly the Jaxartes). Take in the panoramic view of the ruins of mediaeval Ahsikent city. Parts of the ancient, underground water collection system kyariz (developed in Persia) still remain. Return via Margilan and visit the workshop of hereditary weaving master Fazlitdin Dadajanov. 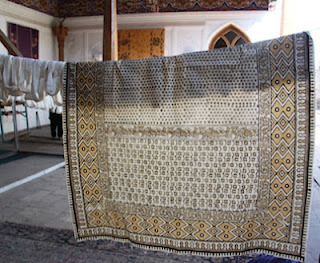 He specialises in bakhmal – silk velvet ikat. Overnight in hotel in Ferghana. Start the day with a visit to the Yodgorlik Silk Factory in Margilan (open Monday – Friday only and closes at 4:00 p.m.). 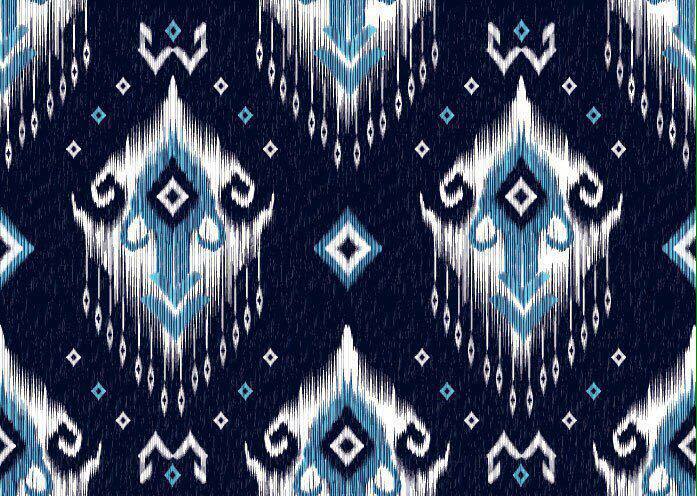 Here you will see the entire process from cocoon to finished ikat. Later drive to Andijan, the birthplace of Babur. Babur was the great-grandson of Timur and founder of the Mughal dynasty in India. Visit the literature museum of Babur then lunch at a local restaurant, which serves excellent fish. 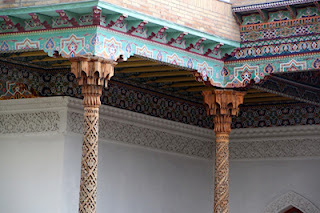 Stop at the Andijan Handicraft Centre, situated in a rambling, old madrassah. Artisans there include doll and puppet masters, weavers and a national costume maker. 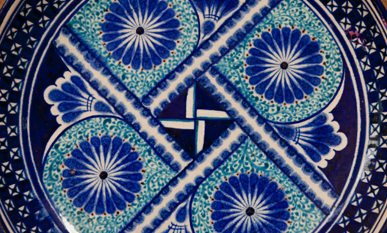 Later visit a 14th-generation ceramic master in Andijan, followed by a basket maker's workshop. Overnight in hotel in Ferghana. Visit Said Ahmad Hodji's mausoleum in Margilan and then the workshop of musical instruments master Rahmonali aka. Visit the wood carving centre at the house of Master Haidarov in Kokand. It is a in beautiful setting and there is a small, family museum showcasing the seven generations of this family's work. The great-grandfather made special pieces for Lenin. Lunch in Kokand and drive back to Tashkent. Evening arrival. After breakfast drive to the Namangan region, known for two distinctive architectural sites. First, visit the 18th century mausoleum of Khodji Amin. It is built in terracotta, following the style of the 11th century. Then visit the pentagon-shaped Mullo Kyrgyz mosque – classical mosques are quadrangles. On return to Ferghana stop in Margilan and visit Yodgorlik Silk factory. (Open only Monday - Friday; closes at 4:00 p.m.). 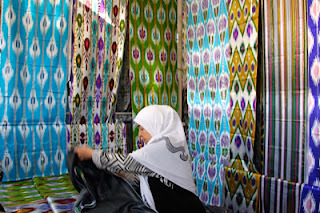 Margilan weavers are the most skilful ikat weavers in the world. Here you will see the entire process from cocoon to finished ikat. Overnight in hotel in Ferghana. After breakfast drive to Kuva, the ancient archaeological site from the Kushan period. Then drive to Andijan, the birthplace of Babur. Babur was the great-grandson of Timur and founder of the Mughal dynasty in India. Later visit Akbarobod village and the home/workshop of a savatchi (basket maker). En route to Ferghana, visit the Said Ahmad Hoji madrassah built in the end of 19 C and now used as a training centre led by Rasuljon Mirzaahmedov. 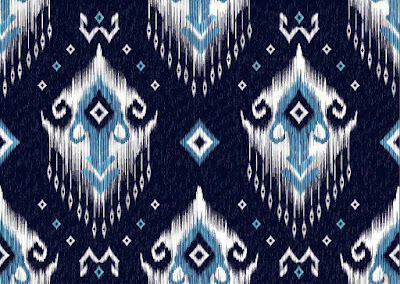 This is the renowned ikat weaver mentioned in the post on Oscar de la Renta's love affair with ikat. The setting of the centre, with its own canal, is lovely. 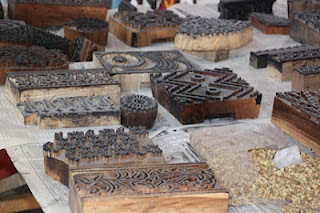 There is also a master woodblock printer, Abdullaev Solidjon, at the centre. Overnight in hotel in Ferghana. Today you will return to Tashkent, first visiting Oltiarik village where instrument maker Rahmonali lives. He makes Uzbek traditional musical instruments like rubab and dutar. 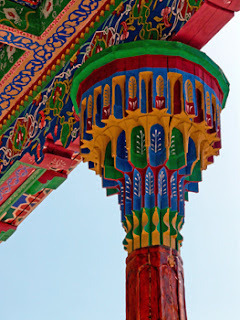 Stop in Kokand again to visit the wood carving centre at the house of Master Haidarov in Kokand. It is a in beautiful setting and there is a small, family museum showcasing the seven generations of this family's work. The great-grandfather made special pieces for Lenin. Evening arrival Tashkent. Prices are listed per person based on the number of people travelling together. Prices were valid in 2018. Single room supplement: US$110 per person. Transport: driver and sedan car for up to 2 people for the whole trip. More than 2 passengers, then a mini-van will be used from and back to Kokand. (Note - minivans are not permitted to cross the Kamchik Pass. Also it may not be possible to hire an air-conditioned mini-van in the Ferghana valley). The Terms and Conditions for these Ferghana tours are very similar to those outlined in the general Terms and Conditions section. A specific, separate terms and conditions file will be sent prior to booking. By booking a trip with Uzbek Journeys (ABN: 72818242110 , Travel Agents Licence 2TA0882) you are deemed to have agreed to those Terms and Booking Conditions and, provided there is availability, your booking will be accepted on this basis. Please contact me if you are interested in a Ferghana optional excursion. I will forward you a pdf file containing the terms and conditions, booking form and participant declaration. The Ferghana tours are separate excursions and therefore require a separate 25% deposit. To keep costs low, Uzbek Journeys is an online travel agency only. There is no facility to accept bookings from participants who do not have internet access. All documentation, updates, visa forms etc are sent and received electronically.